How do you plan to celebrate Global Zinfandel Day, Friday November 19, 2010 from midnight to midnight? If you want to get social, use the #Zinfandel hashtag to connect with other zin lovers on Facebook, Twitter, Foursquare, Gowalla, blogs, etc. You can also search the hash tag on social sites to see what others are drinking and read what they’re saying allowing you to connect and chat with other Zin drinkers around the world. If you’re using twitter or are new to twitter, a fun way to engage and connect with other zin fans is to use HootSuite or Tweetdeck and set up a search column for #Zinfandel. This way you can keep up with other Zinfandel drinkers from around the globe. What to enjoy while you’re drinking zinfandel? Barbeque anything is a natural choice–have you ever had zin with hot dogs? Yummy! (That’s what we had last weekend camping!) Personally, I think a good zin is one of the most versatile wines out there and goes well with just about everything–including Thanksgiving dinners! Zin is much better than pinot in my opinion because zin is robust enough to standup to all those complicated flavors. I am hoping Global #Zinfandel Day will get me out to meet one of my facebook friends Chris Brown and taste her wines. 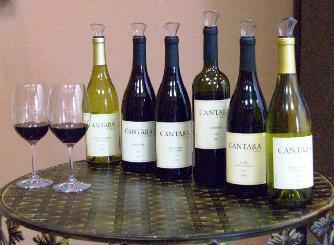 Chris is co-owner of Cantara Cellars, a winery, tasting room, lounge and event space which opened to the public three years ago in nearby Camarillo (126 N. Wood Road, #104, Camarillo, CA (805) 484-9600). Current production is 3,000 cases, and just the other day they were bottling their 09 Old Vin Zin from the Lodi AVA in magnums for weekend pick-up. They’re open Friday nights from 5-7:30pm and weekends 11-5pm. I’ll let you know if Chris and I get something special going for tomorrow at Cantara! I wonder how many zinfandels they might be able to put out for a tasting? Great post. Hope you enjoyed #Zinfandel day!